SeaBus carries approximately 16,000 passengers per day, carrying over six million people on an annual basis. Since the ferry service began operation in 1978, there have been few upgrades to the SeaBus terminals. 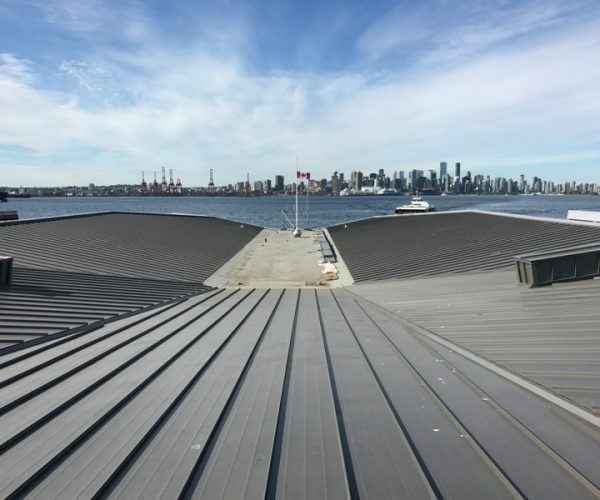 To keep the riders and employees safe, a major overhaul of SeaBus terminals on both sides of Burrard Inlet and the administration building in Lonsdale is needed. The $12.5M project is to retrofit the roof, metal cladding, and windows of the terminal buildings in Lonsdale Quay (North Terminal) and Waterfront (South Terminal). Atlas worked closely with client and project participants to ensure all roof top maintenance requirements could be carried out safely and effectively. Using our rigid extruded aluminum rail we attached directly to standing seam roof, eliminating any penetrations through the roof itself. The system facilitates safe access to perimeter roof drains and mechanical equipment without the need to transfer between independent anchor points. Atlas provided a safe, functional and cost effective solution for this high profile project.